Home » How should headhunters fit into your job search? In terms of my practice as a search and placement professional this is a bit extreme. As far as someone’s “reputation” let’s not place status over results. The most successful professionals in an industry can step back and see when the current paradigm is going to shift, and actively engage in the creation of new markets. There are no openings for such individuals. They are often hired opportunistically based upon the ideas, concepts and solutions to problems that they are bringing to the table. In 1968, when I was pretty much just starting my career, I had worked for a year as a programmer for a bank in Philly, and decided it was time for a change. I replied to a headhunter’s ad for a position, and was sent on an interview at RCA in Camden NJ. RCA at the time was manufacturing computers. The manager who I interviewed with put a really hard sell on me: told me how much he needed me to come and work for him, etc. I had also interviewed with Control Data Corp (CDC), which also manufactured computers, in their Philly sales office. They had made an offer to me as well. After carefully considering both offers, I decided that I would accept the offer from CDC. As a courtesy to the manager at RCA I gave him a call to tell him my decision, but he wasn’t there. I then called the headhunter to tell them my decision. Guess who answered the phone?! Yep, the manager from RCA, who had gone to work for the headhunter just after he interviewed me. Hmmmmmm…. Is the caller a scam artist or a real headhunter? Here’s a quick test:ask questions.How many direct reports? What system(s) does the company use? 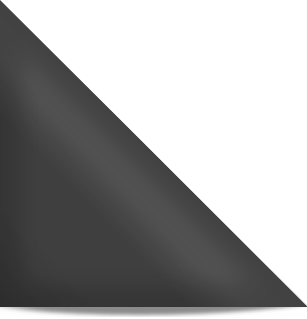 If there is a software product used almost always in your industry? ask about it.What position does this job report to? What is the breadth of responsibility of the job? Is it a new position? if not, why is it open? Does the person you are talking to seem to understand your industry? These sort of questions will usually tell you if you are talking to a real headhunter.It could be a legitimate headhunter who does not know what he is doing – he might as well be a scam artist. There may be a reason (beside headhunter’s paranoia)which prevents the headhunter from telling you the name of the company involved – an incumbent in the job, a chronically ill person being replaced etc. @Allan Geller: You’re not describing a headhunter. You’re talking about your own definition of what a “placement professional” does. “Placement” refers to finding a job for someone. That’s not what headhunters do. I’ve got no problem with new models for putting people into jobs. I have a problem with cold callers collecting resumes from people they don’t know without any intention of actually “working” with them. The market is rife with such scammers. @Steve Berkwits: Your story is played out every day on telephone poles across the U.S. Signs say “LOSE 100 LBS OF UGLY FAT!” and “WE BUY HOUSES!” What’s the job? Posting more of those signs, after you pony up $$ to buy your own inventory. Look, I know of cases where a headhunter’s candidate joined the search firm, and it was a legitimate deal and a good idea. But those are very, very rare. Thanks for sharing your experience! Pete Miller’s suggestion is a powerful one. Fast-buck cold-callers are in possession of a list of buzz words that they use on the phone or in an e-mail. Several detailed questions quickly reveal whether the “headhunter” really has a client, is expert in the field in which he recruits, and actually has a specific job to fill. A good headhunter already knows who you are, or would not be calling you. She will possess at least several useful facts about your credentials and experience. If the caller knows nothing about you, then you’re wasting your time, because the call did not come via a credible referral. Good headhunters track potential candidates down through people who know them. Here’s where this gets confusing. A byproduct of finding a job for someone often leads to what you by definition would call a headhunting project. When I place someone and a client who incidentally pays me a placement fee from the same bank account that he uses for his headhunting projects turns around and asks me to recruit for a formalized position that he needs filled are you saying that I’m not a headhunter? FYI: Headhunters run blended businesses. Some combine contingency with retained models. Some combine headhunting with consulting services. I happen to combine seach (headhunting) with placement. I must have been successful in keeping my resume off the internet. I never get scammy head hunter calls or questionable email. The longer I stay in IT, the less I desire the “services” of scammers. Especially the ones who cannot tell me anything about the position in clear, lucid, un-accented English, but rather yammer on about this “necessary” position that I must fill, half across the county for only 3 months. 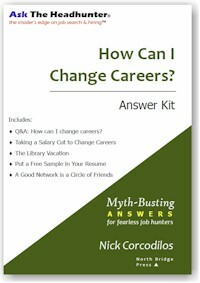 Maybe that’s it: Instead of relying on head hunters, scammers, resume shufflers, job boards, networking, etc. we just all need agents! @LT: I think agents are an interesting idea. But there’s a reason only pro players have them – there’s little benefit to an agent in working with Joe Off The Street. Joe needs to learn to be his own agent. It must be part of a successful career. 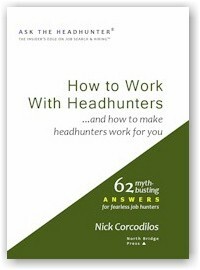 The problem I tried to address is, people think that a “good headhunter” will serve as an agent. That’s not what they do. Allan Geller’s comments notwithstanding, a “headhunter” who calls out of the blue claiming he’s going to find you a job is likely wasting your time. Consider how often people get incredibly frustrated with “headhunters.” This is why. I have been recruiting for over 20 years. Nick is right on point. some of the best points are in the other two articles he wrote and recommended.
!) As a recruiter you always have a few clients who want to see any A+ candidates you find in a search, or just maybe happen to contact you. But that is not thousands, hundreds or dozens. I can usually make those calls in a couple hours. As a candidate keep in mind you probably have to be in the top 5, maybe 10% to make this happen or have an unusual combination of skills. 2) The second situation is marketing a candidate or two for job orders. This used to be fairly standard practice, but is used infrequently now. Notice a candidate is being “used” to get job orders. If a recruiter gets an interview for that candidate that’s a plus but not the real objective. Again this is not standard practice anymore but some, like me, still do it once in a while to stir the pot. Alan, in my mind and experience if I am having to call hundreds of companies with one resume I am not recruiting (which legitimately you may be saying.) But more important I am either doing some things wrong and/or wasting valuable time. Finally the best recruiters do develop very strategic relationships with a few clients that go well beyond recruiting a few positions annually for them. But that is not going to typically help the job hunter. Bottom line, don’t wasted your time on the boards nor a whole lot on recruiters. Spend the bulk of your time networking. 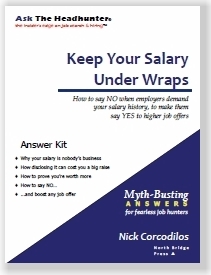 Also if you have not read Nick’s first book , in particular about how to perform in an interview, spend the few dollars and get it. Bill, I appreciate your perspective however IF I have a sunstantial candidate that can deliver the goods in terms of increased revenues or competitive advantage, I am willing to call on thousands of companies to make a placement for that individual. If your child is trying to walk and falls down time and time again do you give up your support and say that there’s something wrong and it’s ok not to walk? When you say that you may be doing some things wrong and/or wasting valuable time, could you be more specific? I don’t know about you, but I’d gladly give up 10 or 15% to just sign a contract for really decent money that indicated respect for my 20+ years in IT, and a signing bonus. I don’t think the economy around here would be hurt by that, and it might be fun to watch as well. One way of looking at the differences is like bookends. On one end are bottom feeder agency recruiters and on the other highly professional true headhunters. In reality one size doesn’t fit all as there are all kinds of flavors between. There are many ways to define the differences,some noted herein but one way to think of it is how you go about your business and in most cases, unless you are an independent headhunter/recruiter, how you are expected to go about your business. Headhunters are pro-active relationship sales driven . plan ahead, research, build relationships with clients and candidates. anticipate & be ready to close. in my experience they are good networkers, if you are a good networker. Networking the magic word talked about in other columns. A candidate should strive to have some headhunters in their networks and themselves be proactive. A networking headhunter will always have an eye on business, but will still be in touch with you, not just when there’s a search on the table. The candidate should be in touch likewise, and be a willing source of help. What the candidate and those like him don’t understand is how the headhunter/recruiters working environment effects their behavior. There’s an old saying..”show me metrics, and I’ll show you behavior” If that recruiter works in an agency that is a cold calling boiler works you are not encouraged, nor have time to work on long cycle relationship building headhunting. And you’re likely metric’d on #’s of calls per day, duration of same and #’s on f/face interview. In short you’re focused on job transactions, not people. It’s a high turnover environment because the office either doesn’t like your #’s or you don’t like their metrics and the boiler room. Conversely headhunters work in a much different business model, one designed to establish close relationships with clients, candidates, potential candidates and the business community. And if they are good with managing relationships they shine. 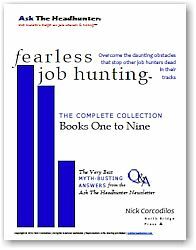 If you plan of utilizing headhunters or recruiters it’s no different from advice given here in other columns. If you’d like to work for a company, do your homework, research it. If you’d think you’d like to work with a recruiter or headhunter, do your homework, and research them or their company. Recruiters research you, turnaround is fair play. Know who you are doing business with. I get that, and that’s fine. But to echo Bill Gaffney, that’s not a headhunter. It’s a choice you make to do placement. @LT: Go for it, if you can get an agent. When I was trying to peddle my first book, an editor who’d read an article about my self-published book called me out of the blue and invited me in to meet the publisher in New York. These were big-time publishing people and I was floored. We sat around a table, and they told me they wanted my book. They said they wanted to make me an offer, and would I entertain that. They made a first offer shortly after. By the time my agent was done, they paid double their first offer. I’m all for agents. When you can get one.